Vikiana Petit-Homme, 16, led a meeting in Boston this week to recruit more students for the national student walk out planned for March 14. "We're just going to do what we have to," she says. 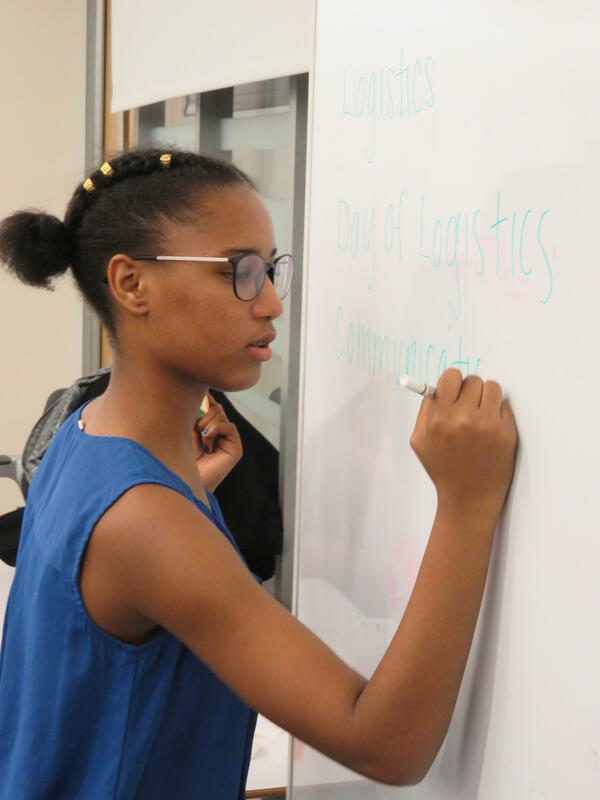 Student organizer Vikiana Petit-Homme, 16, writes out the agenda in advance of a meeting about joining a national student walk-out on March 14. That date marks one month since the mass shooting at a Florida school that left 17 people killed. After last month's mass shooting a Florida high school, students around the nation have staged walk-outs, rallies and other demonstrations to advocate for stricter gun measures. In response, some school administrators have threatened to suspend students who protest, and are being criticized for cracking down too hard. At the same time, many colleges are sending the opposite message, encouraging and congratulating students' activism. In Boston, New Mission High School junior Ariyana Jones says many students at her school have been scared off from participating. "Teachers will tell you straight up if you walk out, you will get written up and suspended," she says. "They are trying to intimidate us, and I feel like it's working because they don't want to get that on their record or get in trouble." Needville, Texas Superintendent Curtis Rhodes, was more explicit, posting a warning on Facebook forbidding demonstrations during school hours, and threatening 3-day suspensions for anyone taking part. "Life is all about choices, and every choice has a consequence whether it be positive or negative," he wrote. "We will discipline no matter it if is one, fifty or five hundred students involved... and parent notes will not alleviate the discipline." The post has since been taken down, and the school declined comment, but the warning got students worried — and got lawyers involved. "Really what that is, is retaliation for a student expressing their first amendment rights," says Texas ACLU Staff Attorney Kali Cohen. She says the hard line approach is not only unconstitutional, but also flies in the face of public schools' mission, as affirmed by the U.S. Supreme Court, to prepare young people to be engaged citizens. And colleges couldn't agree more. Scores of colleges have posted and tweeted to reassure students that if they get suspended for taking part in a peaceful protest, it will not diminish their chances of getting accepted. As MIT put it, students do not have to "choose between speaking out and getting in." Brandeis echoed the sentiment, tweeting "#Brandeis supports students' right to stand up for their beliefs." The tweet not only assured students their admission would not be jeopardized if they were disciplined for peaceful protest, but the tweet went further to urge them to go for it, saying "Speak up, speak out." Brandeis says such activism, not only won't hurt students' chances of getting accepted, but may actually help. "Having the bravery to stand up, to organize people, that takes a lot of courage and that is certainly something that I think would be applauded here," said Brandeis University Dean of Admissions Jennifer Walker. "From a Brandeis perspective, I think speaking up and speaking out is a good fit for our campus culture." Students like Michael Martinez, a junior at Weston High School in Massachusetts, are taking comfort in the overwhelming support from colleges. Having personally lost a close relative and a family friend to gun violence, he's volunteering to help coordinate students across Massachusetts to join the National Walk-Out planned for March 14. "We want this to be more than just a march," Martinez says. He's organizing an afternoon of lobbying at the State House, to follow the walk out. "This is an opportunity for students to really, really get involved in a way that I don't think a lot of students have ever been before," he says. "Young people to practice civic responsibility, service, community leadership and advocacy. I mean, it's a real life lesson, and a lot more valuable than anything a student would be learning in a classroom that day." Student organizer Vikiana Petit-Homme, a junior at Boston Latin Academy, agrees. "Schools should be encouraging youth to speak," she says. "They are there to prepare kids for the future, and [that means] learning to make sure we're heard. They should not be silencing us." The outcry from students and parents and the response from colleges seems to have prompted some high schools to soften their stance. In Virginia, the Prince William County schools sent out a letter last month warning students that those who disrupt classes or leave school without permission will face disciplinary action. But after a bit of a uproar, officials sent a second letter the next day saying they had "clearly sent the wrong message" and promising to "allow for some flexibility." But neither can it just be anarchy, says Associate Superintendent Phil Kavits; Schools have to balance students' rights with student safety. "There have been examples in the past where people have had walk outs and decided to march down busy streets," Kavits says. "And when they do that, we've lost the ability to keep them safe." Just this week, some 700 middle school students staged a walk out, after informing school officials that it was coming, and getting their blessing. In Boston, high school students gathered to plan their March 14 walk out were waiting to hear how friendly their administrators would be to the idea, when School Superintendent Tommy Chang popped in unexpectedly, and pleasantly surprised them. He praised their work, and assured them they will not be disciplined for it. It was welcome news to students like Petit-Homme. But she's quick to add, no official policy would have stopped her anyway. "At this point, we've seen the adults are not doing what they're supposed to be doing, which is to keep us safe," she says. "So we're done with going to them and asking for permission. At this point we're just going to do what we have to." Yes, Petit-Homme says, protests will be peaceful, but she says students cannot promise that they'll never disrupt the school day. "The whole point is to be disruptive, to make sure we catch your attention. It's to make sure that you are hearing us. So causing a disruption is exactly what we're going for." There's no guarantee if, or when, it may result in real change. But it will almost certainly make for a college application essay the admissions committee will love. As students across the country protest gun violence, schools have reacted in different ways. Some have tried to crack down, even threatening to suspend the protesters. But many colleges are sending students the opposite message. They're encouraging and congratulating the teens' activism. NPR's Tovia Smith reports. TOVIA SMITH, BYLINE: Since last month's mass shooting at a Florida high school that left 17 people dead, the wave of student protests has been building. 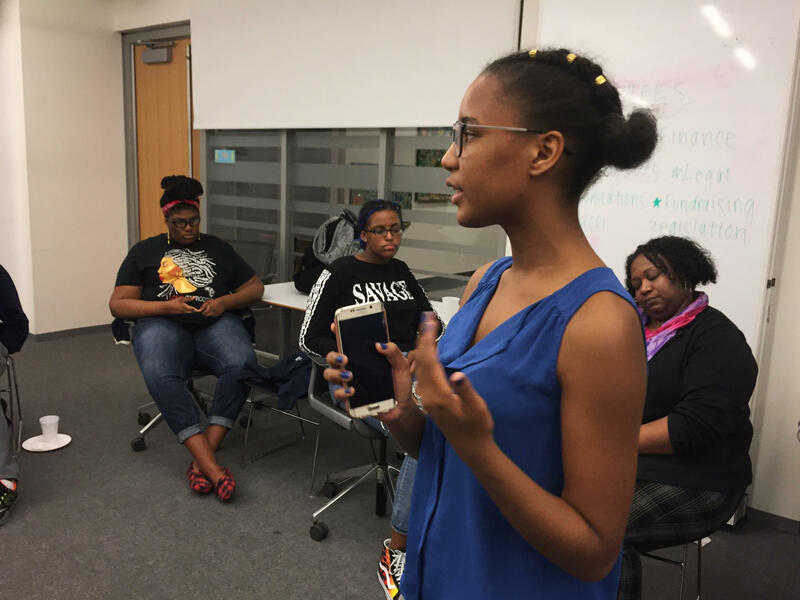 SMITH: Vikiana Petit-Homme, a Boston Latin Academy junior, led an organizing meeting in Boston last night urging students to join a national walkout planned for March 14. PETIT-HOMME: ...Yeah, so can we please split up, groups of three and four? Logistics. Finance. SMITH: But some students here say their schools are discouraging their protests, like New Mission High School junior Ariyana Jones. ARIYANA JONES: Teachers, like, will tell you straight up, like, if you were to walk out, you would get written up and suspended. And they are trying to intimidate students. And I feel like it's working because they don't want to get that on their record or get in trouble period. SMITH: Other schools have sent explicit threats in writing. The superintendent in Needville, Texas, posted a warning on Facebook forbidding demonstrations during school hours and threatening three-day suspensions for anyone taking part. The post has since been taken down and the school declined to comment, but the warning got students worried and lawyers involved. Texas ACLU attorney Kali Cohn says the hard-line approach is unconstitutional. KALI COHN: That's really what that is, is it's retaliation for a student expressing their First Amendment rights. SMITH: Cohn says the crackdown also flies in the face of schools' mission as affirmed by the U.S. Supreme Court to prepare young people to be engaged citizens. As it turns out, colleges couldn't agree more. JENNIFER WALKER: From a Brandeis perspective, I think speaking up and speaking out is a good fit for our campus culture. SMITH: Brandeis University Dean of Admissions Jennifer Walker says if a student is suspended for peaceful protest not only will it not hurt their chances of getting accepted, it may actually help. WALKER: Having the bravery to stand up, to organize people to stand up for what they believe, that takes a lot of courage. And that is certainly something that I think would be applauded here. SMITH: Scores of other colleges are sending a similar message telling students they do not have to choose between speaking out and getting in, as MIT put it. It all seems to have prompted some high schools to soften their stance. In Virginia, Prince William County schools had sent out a letter warning that students who disrupt class or leave school without permission will face disciplinary action. After a bit of an uproar, officials said they sent the wrong message and promised to be flexible. But Associate Superintendent Phil Kavits says schools have to balance students' rights with students' safety. PHIL KAVITS: There have been examples in the past where people have done walkouts where they've perhaps decided to march down busy streets. And when they do that, we've lost the ability to keep them safe. UNIDENTIFIED STUDENT #1: If you - did you sign it? Yeah, so, like, I'll contact you. SMITH: In Boston, high schoolers gathered last night were still waiting for an official school policy on protests when school superintendent Tommy Chang popped in unexpectedly. He offered his encouragement. TOMMY CHANG: I just wanted to say it's great that you guys are doing this work. I can't stay. I just want to say hello. UNIDENTIFIED STUDENT #2: Thank you. UNIDENTIFIED WOMAN: The kids are concerned about getting disciplinary action if they walk. CHANG: They will not be disciplined. SMITH: That was welcome news to students like Vikiana Petit-Homme. But she says no official policy would've stopped her anyway. PETIT-HOMME: At this point, we've seen that the adults are not doing what they are supposed to be doing, which is keep us safe. So we're done going to them and asking for permission. SMITH: Protests will be peaceful, Petit-Homme says, but some disruption is needed to get attention and make change. And no matter what, there will definitely be a college essay out of it. Tovia Smith, NPR News, Boston. (SOUNDBITE OF HOT CHIP SONG, "THE WARNING") Transcript provided by NPR, Copyright NPR.